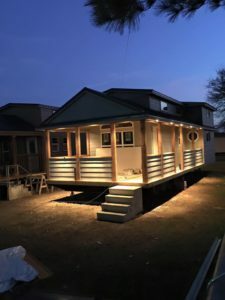 One of the most important parts of building or choosing a tiny home is to consider your personal lifestyle. What home features are most important to you? 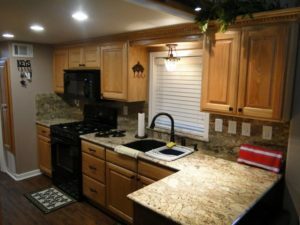 An experienced tiny home seller can assist you in choosing the right options. Here are a few tips to help you along the way. Tiny homes offer so many opportunities to get creative in design. 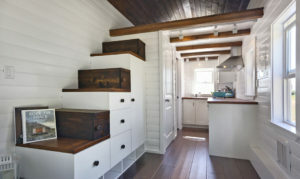 While building a tiny home means that you may potentially have fewer closets, there are still many options for storage. For example, you may find that you want to place storage and/or a coat closet under the stairs heading up to your loft area. Another option we have seen requested are floor to ceiling bookcases. Built-ins around your washer/dryer area offer optimal space to store your cleaning and laundry supplies. The options are almost endless. Let’s get creative! While many tiny homeowners choose to have their home on wheels to allow for travel, just as many choose to place the home on a piece of land with no intentions of moving it anytime soon. A patio setting to enjoy your morning coffee or simply read a book can offer you a space of your own. 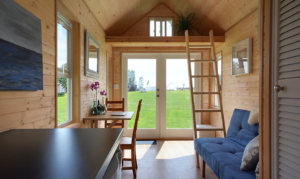 Tiny homes with a loft no only provide privacy but also allow to create a space of your own. The loft does not have to be a bedroom, it could be a reading nook or shared space. If the tiny home is going on a vacation property, it could be a play loft for the kids. When placed correctly, lofts can also allow for more natural light which reduces your need to add additional lighting for daytime use. Choose what room you love and make it big! Depending on the use of your tiny home, you will want to make sure the room you love the most is the largest. For many, this is the kitchen. For you, it may be a common room. Whichever room you absolutely adore, for your attention on that. This may mean being creative with reflective surfaces or simply making space for the chef in you!